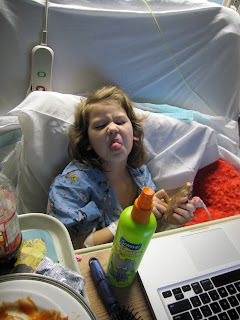 Amaya's Journey with PFFD: Has it really been two weeks? Has it really been two weeks? The past two weeks have been a blur. Time has passed so quickly. The first week post surgery was pretty tough; mostly because we had a hard time getting Amaya's pain under control and getting her comfortable. The first night in the hospital was the worst. Mostly because the nurse assigned to Amaya gave her children's Tylenol for pain management. After hours of restless pain, Josh demanded more pain medication. The nurse finally gave Amaya Valium and morphine. That did the trick! Amaya was finally able to sleep and recover. This week has been a lot easier (even though we had to move over the weekend). Amaya even went back to school. I wasn't sure if she was ready, but she wanted to go. So I went with her on Tuesday and showed her teachers how to move her in and out of her wheelchair. She did great! I was amazed at how smoothly she transitioned back into school. All the preparation that her teachers (they are amazing!) did prior to the surgery payed off. It was nice to see her friends being so kind and thoughtful. They moved chairs for her to get by, included her in tasks (even cleaning up beads off the floor), and would ask if she needed help, instead of assuming that she would want it. Amaya has handled the situation so wonderfully. I am so proud of her; she has been brave, kind, empathetic, self aware, and accepting of her body. The past two weeks have drained Josh and I and have kept us in survival mode. As things ease up, we are now beginning to catch up on sleep. We have been sustained by the kindness and help of so many, both family and friends. Thank you all. Josh's co-workers prepared meals for us to last several weeks, and it has been so nice not having to worry about what we will eat. Amaya is now wearing a pink cast that covers her full leg (from her upper thigh down to her ankle), this has helped so much in relieving her pain and discomfort. It is easier to move her and keep her comfortable. We noticed a huge difference once she got the longer cast (her first cast only came up to her mid thigh, and was pushing in on her upper incision). That very night she was able to roll in her sleep with no pain or discomfort and two days later she was completely off all pain medications. 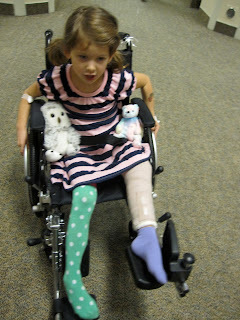 She will continue to wear this cast for two more weeks and then go see her doctor to remove the cast. Dr. Nelson said that Amaya should be able to walk after it is removed. Depending on how she adjusts to her new ligaments she may need to do some physical therapy. Dr. Nelson was very happy with the results from the surgery. One of the assisting surgeons told us that when they opened up her knee she didn't have any of the ACL ligaments (something he hadn't seen before), but he was impressed with how Dr. Nelson was able to use her own muscle to create them for her. 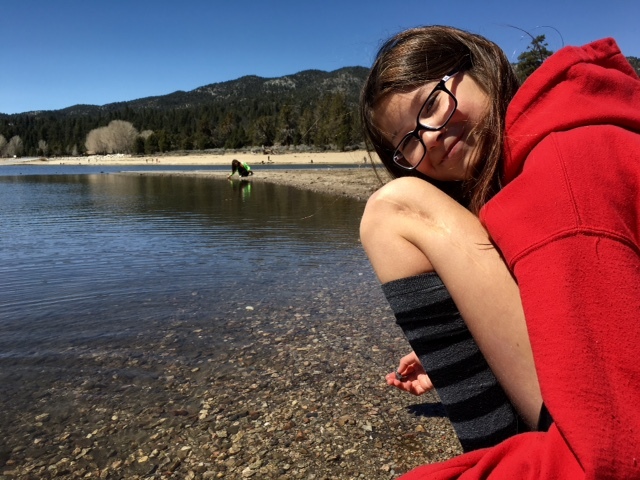 During the super knee procedure Dr. Nelson used the fascia lata muscle from Amaya's thigh to create her missing ligaments. To prepare for the lengthening surgery the fascia lata muscle is removed because it doesn't lengthen like the rest of the muscles and tissues in the leg do. Instead of just discarding the muscle, Dr. Nelson was able to use it to create ligaments for Amaya. That's pretty amazing! We are so fortunate to have Dr. Nelson here in Loma Linda, few doctors know how to perform the super knee surgery. The timing has been wonderful; Dr. Nelson came to Loma Linda in August 2010 after being in the Dominican Republic for five years. During his time in the Dominican Republic he served as the medical director of CURE International Hospital in Santo Domingo. During this time Dr. Nelson occasionally partnered with Dr. Paley (the doctor who created the super hip and super knee procedures) and had a six month internship with him. We were also fortunate that Amaya didn't have to be in the spica cast (it starts at the waist and goes down to the ankles). After reviewing her file, the night before surgery, he decided she didn't need the super hip procedure (the bones in her hip are in good shape). The knee was his biggest concern right now. Later when he does the lengthening surgery (in about one year) he will correct the leg shape (it turns a bit above the knee) and correct the hip as well (the muscles around the hip restrict her hip movement). It's hard to believe that she as an individual and us as a family have had to endure so much in such a few short weeks, but we did, we had to, and we weren't alone. So once again, thank you! This was our first day home. Her cast is covered with an ace bandage to protect it. This was one of those moments when she was not so pleasant.